PA WORKS has always impressed me with their art. This anime is no exception; it has amazingly gorgeous artwork. The problem is that having stunning backdrops/artwork does not, SHOULD NOT, exempt you from having a storyline that makes sense, or God forbid the dialogue from making sense! Person 1: The sky is blue today isn’t it? Person 2: I miss you and I think you should be careful of falling vases. Do you understand the point I’m making?? The dialogue was an unrealistic mess for a slice of life anime. And are these people REALLY a group of friends? Because as the anime progressed none of them really talked genuinely with each other; they all seemed like cold strangers who kept secrets from each other more than anything. I couldn’t follow what was going on. The characters seem to lack character. Sure, they all have hobbies, but as the series goes on the personalities I thought they had seem to fade away. I’m on episode 10 and with only a few eps left until it ends, I don’t see how they can salvage the wreck it became. I’m disappointed to say the least. I think my favorite character is Jonathan. A chicken (or was he a rooster?) kept on the school grounds. He didn’t talk or had magical powers. He just pecked the ground. I think I really hit it off with him. I know all the fanboys who always rate things 5 stars will mark this as "not helpful" even though what they mean is "you are mean, waaah" Well, so be it. 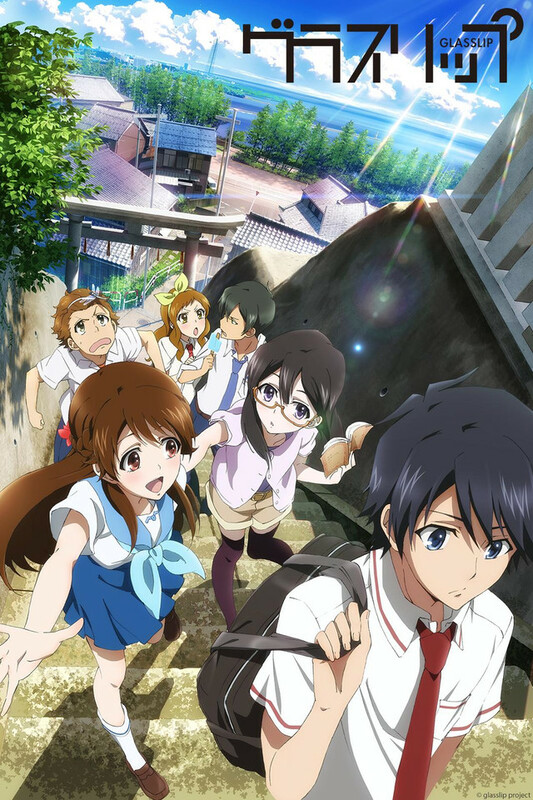 Glasslip is pretty, but it is an achingly slow romance with sci-fi elements sprinkled on top and personally I find it rather frustrating to watch. It could be a lot worse, for instance, if characters repeatedly said what others had just said, or like in Ruroni Kenshin where our hero repeatedly lists every person he's ever killed along with their favorite breakfast food. This isn't like that. It's much closer to the opening scenes in Totoro where we are introduced to the slow pace of country living. The timing in Glasslip has a lot of empty space and neither the social interactions nor the science fiction elements seem to be able to fill in the void. I deliberately skipped two episodes and came back and it seems as if the story line has not really advanced at all. To continue the comparison, Totoro builds up speed throughout the movie. This series seems stuck at the same pace throughout and to me the real suspense is whether or not it will be faster the next episode. I'm sure for some of you this is exactly what you are looking for, in which case you should watch it and enjoy it but sadly to me it seems aimless. Do you enjoy watching paint dry? Or watching the grass grow? Do you enjoy spending all that time and then not being really sure whether or not the paint actually dried or the grass really grew? Well boy, do I have the perfect show for you! Behold, as I weave a tale of mystery, romance and suspense that will leave you in a constant state of almost caring. Glasslip gets 1 star for decent animation and 1 for a pretty good soundtrack. I would give it less, but at least the story wasn't OFFENSIVE, it was merely bad. Beauty through the looking glass. Final revise at season end. Added a rough summery at the bottom of the review as a wrap up of my take on what happened. This slice of life series starts out with a beautiful blend of softer music and an animation that shifts it's style depending on flow, focus, or spectacle. There is quite a bit of attention paid to the smaller background details as well. Despite the beauty of the art, this is not a show that you can unplug your mind and let it wash over you in a leisurely manner. The pacing of the series is relaxed. The clarity of the situations tends to suffer a bit due to an over reliance on the viewer intuitively picking up on subtleties, and in that regard it seems they are trying to force a feeling of outside looking in. We arrive with much of the social framework already engaged and in motion, and at times like hearing half a phone conversation. In this slice of life series we will bear witness to the growth and changes of these six young people as they find love, and perhaps themselves. A well established group of friends, centered around Touko Fukami, in their 3rd year of high school suddenly find themselves confronted with an enigmatic new transfer student Kakeru Okikura. He presents a very odd personality, brought on by his semi nomadic life so far. Like a pebble dropping into a still pond, the arrival of Okikura is already causing ripples that will make for very interesting movements in the story. From the start some of the groups internal dynamics are already evident through the interactions and expressions of the characters, and the impression of depth to character and story is significant. Friendship and romance will battle with youthful uncertainty as feelings are expressed, and secrets revealed. From a step brother (Yuki) and sister (Yanagi) who share more than the same house, to the friendly Hiro in pursuit of Sachi who has a secret of her own, there is a small tangle of teenage emotion to sort out in the course of the series. Touko also learns that her mysterious visions are something more than she ever expected, but although Kakeru initially calls them fragments of the future it is more accurate to call it a transcendant insight. Naturally, She becomes determined to learn how to use it in order to help her friends, but lacking a bit of tact, her actions will bring an assortment of new undercurrents to the surface. Just like Kakeru, this show is enigmatic and mysterious. It layers metaphor like a confectionery, and even after you get below the surface you still may not get all the flavor on the first bite. Overall there is character progression for all of the main characters of some sort, but not as much as expected or made clearly discernible. Touko has an established circle of friends at the start when Kakeru shows up on his nomadic journey. Like ripples in a still pond, his arrival disrupts the artificial status quo of things. Touko has an increse in her visions, and works with Kakeru to attempt a better understanding of just what they are. While initially perceived only as glimpses of the future, they are actually driven by a deeper insight into the world and encompass more than simple precognition. Numerous situations muddle the waters to bring more cause for confusion than answers, but the writers are short on giving up easy clues to follow. It's like the stray glass bead left in the grass right at the end, as if to say that if you wish to find that which you think has been lost, then you must go and seek it out instead of waiting for it to randomly appear. At the end she gains a better understanding of herself, as well as a clearer sense of what she really wants in life. Kakeru is essentially a catalyst for change in the show that doesn't really change much itself, although he does eventually learn to accept happiness for himself where ever it can be found. Hiro is infatuated with Sachi, but initially is afraid to make a move beyond the friend comfort zone. Eventually he gets moving and is able to secure his spot as her boyfriend. Sachi has deep feelings for Touko that border on Yuri fascination, but things eventually settle out after a 3 person confession to simply being best friends. Yuki has his eyes on Touko as well, but after confessing in earshot of his step sister Yanagi, Touko awkwardly friend zones him. Yanagi had long confided with Touko about her feelings for Yuki, and finally makes her move to let things be known. Confusion follows, but eventually they come to terms and look to be accepting of the new dynamic. Glasslip is about Tōko Fukami who hangs out with her four best friends at a cafe called "Kazemichi." During the summer break of their senior year in high school, they meet a transfer student named Kakeru Okikura, who claims that a voice from the future talks to him, and that it's led him to Tōko. His arrival sets off a series of events that will make their final summer together one full of hope and heartache. cause episode 2 will go straight to the point about the plot and their future. But, I can see why you might drop the show around episode 3 or 2 because the show's pacing is slow, but Glasslip is a very interesting slice of life, romance, and drama that you should give a try and stick around from the very end. And episode 6 gets interesting! NEVERMIND AFTER FINISHING THIS SHOW THIS IS THE WORST SHOW EVER MADE BY P.A WORKS. Like what Shirobako ( next anime made by P.A Works ) said," Once an anime has a bad episode, it goes downfall." Which is true. This show was terrible. So much still frames which Shirobako explain as the key animators were slipping without budget! Which I can understand because animators don't get much pay which is very sad. PLEASE DON'T WATCH THIS ANIME! IT'S THE WORST ANIME IN ALL CREATION! BUT DON'T BLAME P.A WORKS. THEY JUST ANIMATED THE SHOW. BLAME IT ON THE DIRECTOR AND WRITER, Junji Nishimura AND Rika Satō. SHAME ON YOU FOR RUINING GLASSLIP! THE ANIME I WAS MOST HYPE FOR THIS SUMMER JUST WENT DOWNFALL. Honestly, back when I watched this when it came out I thought it be pretty good. A good simple slice of life and a hit of romance. It got it but then so much random things happened with hallucinations and self conflicts just over took the whole story and it got really vague....Like this review. XD I'm sorry but this anime lost me. Lack of character development in the place they needed it the most. I think it's safe to say that Touko was supposed to be the main character out of the whole group. Yet out of the whole group we see the least amount of character development on her. Her whole attitude of thinking she knows what she's doing or thinking she's confident enough goes out the window a few minutes later and she gets confused again. This leaves the viewer confused as well since we are unable to keep with her thought-processes since they are simply all over the place. It's incredibly disappointing since she is supposed to be a focal point in the group and is supposed to tie everything together. Instead, we get the complete opposite because her lack of development. Pretty Visuals - Horrible Story. Pass on this one. It has potential... But no. I was really looking forward to this anime. I've watched about seven episodes so far, though, and I'm sincerely unimpressed. The animation is beautiful and the characters and story have potential, however, there is barely any development happening. The story seems very fragmented and very little happens on each episode. Certain events don't make as much sense as they should, in my opinion. I'll keep on watching it, in hopes of a pleasant surprise. But I'm not particularly hopeful on that matter. Shortly after the series completion of Nagi no Asukara, a sea-themed anime which follows dramatic events that rock the sturdy relationship boat of five close friends, P.A. Works debuted their next work, GLASSLIP, which is largely the same premise hinging on a mysterious phenomenon the main characters experience. Touko is your average high school girl with a tight-knit circle of friends who suddenly discovers she has the ability to see visions (called "fragments") of what seems to be the future, and soon meets a boy, Kakeru, who shares these same abilities. They are somehow connected by this power, and as they work to discover why and how, the dynamics of Touko's strong circle begin to change as romantic sparks fly amongst them. GLASSLIP prides itself in its subtle, aesthetic approach to presentation. From long takes of gorgeously detailed scenery to its minimalistic piano-heavy soundtrack, it becomes evident early on that the creators wanted to create a mood that, much like the finer, small events in life, is serene and somewhat subdued. This is easily the series' biggest strength and a unique characteristic that keeps you intrigued to the very end. And that fact proves to be an incredible blessing because—much to its failure— GLASSLIP attempts to apply the same strategic subtlety to its plot. The result is unapologetic, mind-numbingly slow pacing and character development from start to finish. Perhaps it wouldn't be as much of an issue if its major plot focus—learning the true meaning behind the fragments—was simple. Instead, the anime makes every effort to marry philosophical complexity with highly-objective storytelling. This will likely leave many viewers scratching their heads episode after episode, often wondering if the plot is going anywhere at all. Slowly but surely, however, the story does begin to move. The relationships developed between the romantic interests typically make up with chemistry what they lack in depth, and the later episodes share information about the "fragments" in surprisingly well-done manner that brings satisfying closure to the series. All things considered, GLASSLIP, despite its flaws, succeeds in keeping you interested enough to reach its completion. Nevertheless, be prepared to leave this anime with a small sense of disappointment and a bleeding scalp.